Two of the raised beds in the vegetable garden have been completed. Originally they were framed with 2x6 lumber. My property, however, sits on a former wetland and while the ground has been drained, the water table remains very high. Long time readers of this blog will know that I have had all sorts of water problems, months of flooded beds that turn to cement as their minerals stratify. So this year I resolved to add a second round of 2x6s in an effort to separate the planting level from the groundwater. 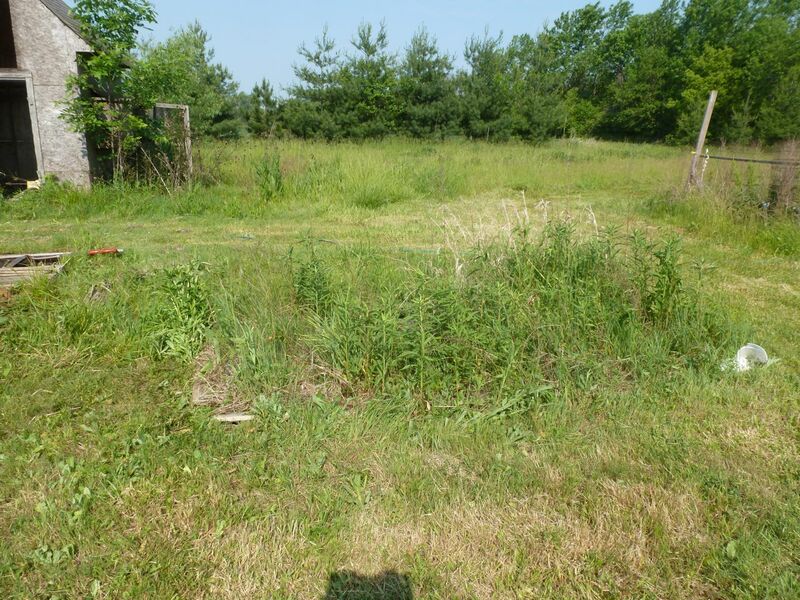 Have been having trouble with the garden tractor, so getting the surrounding grass mowed, and hauling the dirt from the driveway where it was dumped (way up front there, near the house!) back to the garden area has been a major challenge. 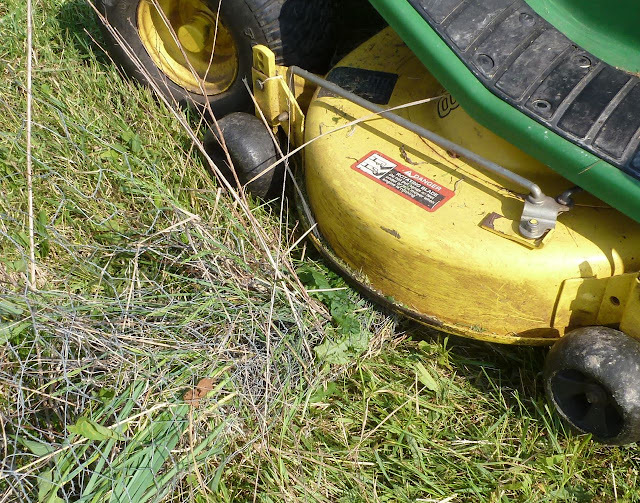 Last week the mower was returned to me in fully operational condition. I have superstitiously decided that the way to keep it working is to run it every day. Every single day. Now there is progress to show for it! 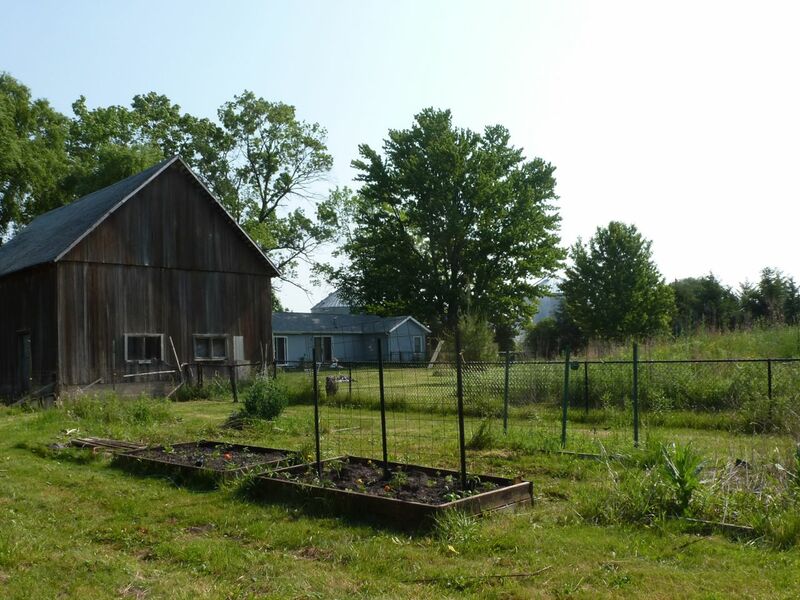 This morning I planted tomatoes and peppers, despite the fact that we are expecting 92 degrees this afternoon. Tomatoes and peppers live for heat, right? I watered them in very well. 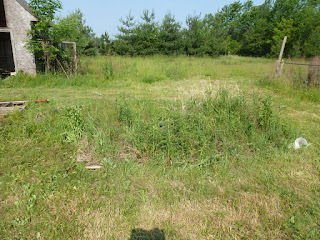 Then I decided to work on mowing back more of the grass in this area. This particular tufty area has been bothering me for a while. It was actually the very first raised bed I built here, my first summer. I planted garlic here that autumn, and got a nice harvest the following July. But I used "one-by" stock to frame it, rather than "two-by". And the frame quickly fell apart. Since by then I had other raised beds, this one became the tufty area I walked past to get to the vegetables. Well not now that I'm on the Daily John Deere plan! I gingerly removed the remaining wood, hyperventilating at the threat of snakes. Don't misunderstand -- I am glad that snakes live in the garden. They eat the bad guys. But hard as I try, I am creeped out by the slithering. And the silence. As it turned out, no snakes today. So that was good. I began going over the tufts, back and forth to remove them. I was feeling pretty good about this morning's progress. Not even 10 am and things were looking quite neat! And apparently some garlic lingers in the bed -- the mowing was fragrant. Until suddenly the blade stopped with a clunk. That is never good. I turned the mower off. I rocked it back and forth to make sure it wasn't hung up on something stuck in the ground. Then, after confirming that the blade was turned off, I turned the engine back on and drove it off the tufts. And this came along. It's a wad of chicken wire. Caught in the blade. The hubby was not impressed. Shirley Says: enjoying your blog, first time I've read it (over T's shoulder). Some day I will get on line myself (T's wish). In the meantime I will try to visit your farm in person....if she will drive me down. And then there were 19. Plus 2.